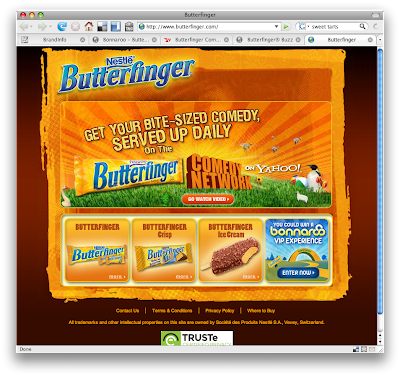 The Butterfinger home site is your standard product presentation site. Masthead, promo boxes etc. Little bit of sound, butterfingery design. They are currently sponsoring a Comedy Channel on Yahoo!, where I found a promotion for their new Butterfinger Buzz candy bar. Apparently it's a Butterfinger + Caffeine. They're sticking caffeine in everything now. The promotion is actually kind of interesting. 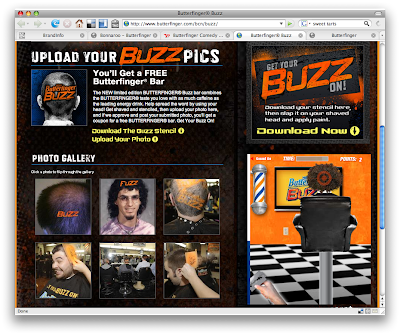 They give you a stencil to download, and you upload a picture of it cut into your head and painted with orange. The only downside is that all you get is a coupon for a candy bar. What's this bar going to cost - a buck fifty maybe? at most? Or it could cost you a head of hair, unless you really have the man-pair to walk around with Buzz carved into your head for a few weeks. I know times are tough...but I don't think they're that tough. I wonder how many pube "buzz" pics they get. They also had live events where people came for a chance to win 2,500$ and a trip for 4 to Las Vegas. Now there's a prize. And the majority of their photos i'm wagering. Oh, and there's a little game there on the right. I played it in my head and got the best score on the planet, so I didn't even need to click on it.